Our innovative, interdisciplinary approach to learning science and technology will inspire your child to create and build through hands-on, cross-functional activities and challenges. Taking an interdisciplinary approach to teaching science and technology gives your child the skills needed to thrive in the 21st century. 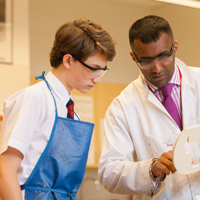 Your child will explore the leading edge of STEAM subjects using a university-inspired model of learning. By tackling real-world challenges across the subjects of science, technology, engineering, art and mathematics (STEAM), your child will develop transferable skills such as flexibility, creativity and communication. They will be encouraged to experiment rather than wait for instructions, and will learn that collaboration and critical thinking can solve even the trickiest problems. 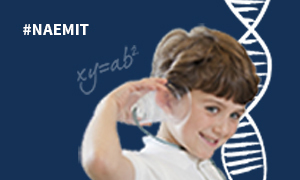 Nord Anglia Education is also working with MIT to introduce your child to this innovative way of learning the STEAM subjects which encourages creativity, experimentation, and teaches them how to apply their skills to real-world situations. Watch our film to learn more about our collaboration with MIT. 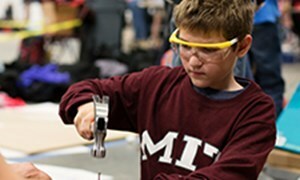 Every spring term, Nord Anglia students will visit MIT to immerse themselves in a culture of hands-on problem-solving. Your child will meet leading MIT scientists, build and experiment in workshops, and learn about the new discoveries that will shape their future. Activities during the MIT visit include everything from building robots, to bioengineering, to coding. Your child will also have a chance to visit MIT and Harvard allowing them to experience student life at one of these prestigious universities. Our STEAM teachers participate in workshops at MIT that expose them to the forefront of STEAM research and thinking. Every summer, Nord Anglia teachers visit MIT to receive hands-on training from MIT researchers and renowned academics. Activities include discussions and workshops with leading engineers and scientists about topics such as climate change, food production technologies, city planning and gaming among other things. Science and technology are traditionally taught separately. Used together they are tools for cracking some of the world’s greatest puzzles. 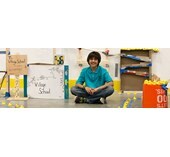 Our in-school challenges encourage students to work together every term to find innovative and creative solutions to complex problems. 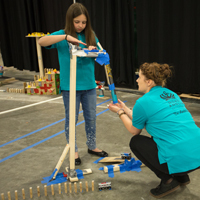 For example, thousands of students at Nord Anglia schools from around the world blended ingenuity and imagination to construct a chain reaction machine. Amazing things happen when you blend the natural curiosity of youth with the learning style of one of the world’s most influential universities. Our STEAM programme in collaboration with MIT develops the skills your child needs for the 21st century.